Nyepi is one of the most special days in the whole year. It is a unique island celebration that will give you the chills and the thrills at the same time. Demons and spirits are called upon, seas of offerings are laid about on the streets and purification ceremonies are held all over the island. Nyepi is the Balinese New Year’s celebration and it is all about restoring the balance between Gods, demons, mankind and nature. Instead of starting the new year with headaches and hangovers, the Balinese start their new year with silence, forgiveness and a restored harmony between everything that lives on and roams the island – the visible and the invisible. Traditionally, Nyepi day is not only a day of silence but also a day of introspection, meditation and fasting. There is no going out on the streets, there is no light to be turned on at night, there is no entertainment allowed and literally, everything is closed – even the airport. Don’t worry, you won’t have to meditate or fast, but you will need to stay inside the compound of your private Bali villa, keep the noise down and the lights off or very low so that it is not visible on the outside. 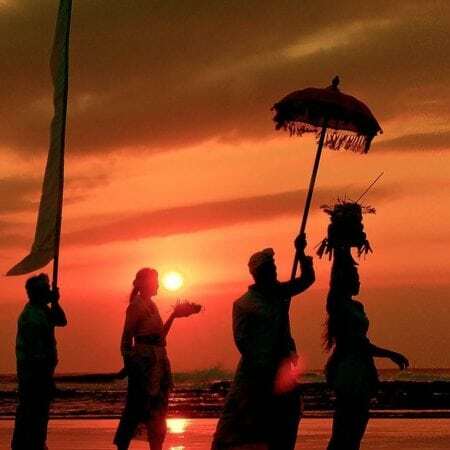 What is the reason for the silence and darkness on Nyepi Day? Well, the Gods are flying over the island on this particular day of the year (the first new moon in the month of March) and because there is no noise to be heard and no light to be seen, they will pass by peacefully. Disappointed? Don’t be! You are part of something unique and special. What other countries in the whole wide world just shut down like this for 24 hours? That’s right: none! 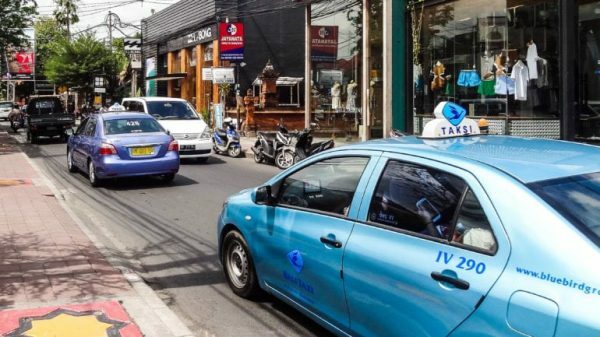 It’s actually really cool, especially in a touristy place like Bali. No wonder they call Bali ‘the island of Gods! Anyways, who minds a full day of undisturbed, guilt-free swimming and lounging by the poolside? Do note that the rules of staying inside are to be taken very seriously. There are local security guards called Pecalang checking the streets and there will be big trouble if they find you outside. 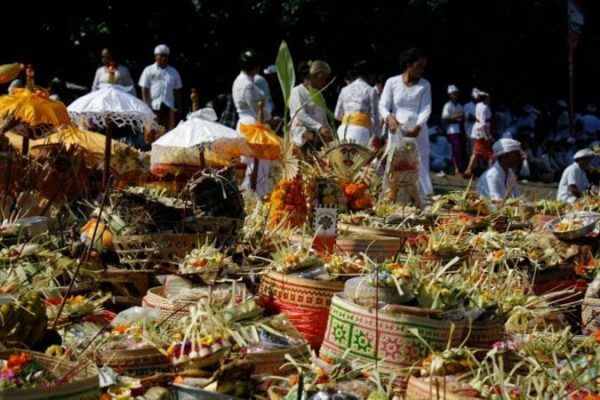 Melasti starts 3 to 4 days before Nyepi and every village in Bali participates. It is an important ceremony and the goal is purification. Each village makes their way to the beach, the lake or another nearby source of water. All the villagers are dressed in traditional white clothing, carrying offerings, banners, and sacred items from the village temple. Everyone prays facing the water and after the praying, there is holy water used to wash the sacred items from the temple with. The holy water is also sprinkled out over the people. 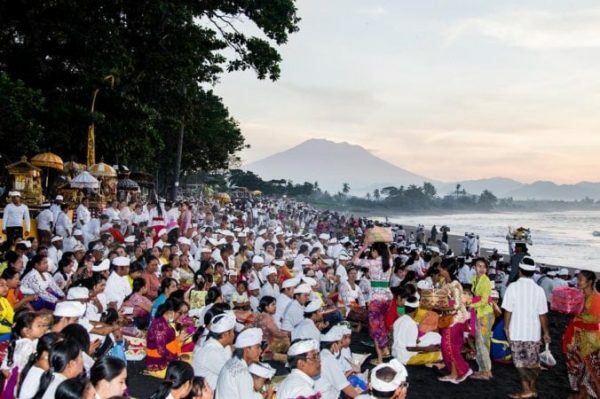 The sea of offerings and the crowds dressed in traditional white clothing on the beach are truly impressive to see. You can watch this enchanting ceremony all day long as all villages in Bali take turns to do their Melasti ceremony. 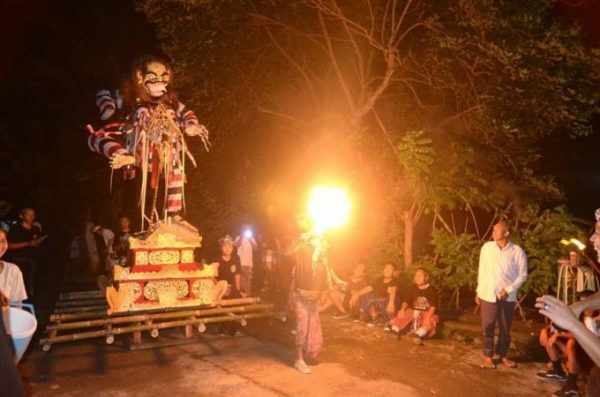 The Ogoh-Ogoh ‘parade of demons’ is the most exciting thing about the Nyepi celebration. 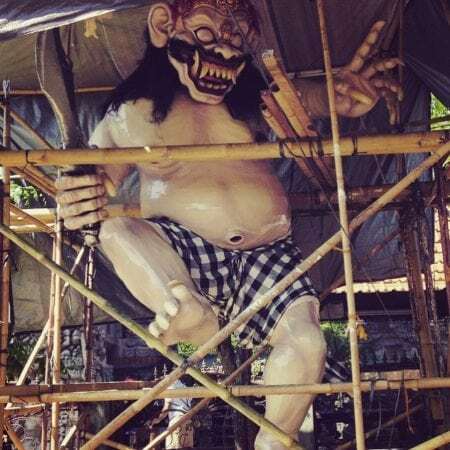 The Balinese already start the making of these frightful Ogoh-Ogoh puppets weeks before Nyepi Day. The giant demon-inspired monsters are crafted with local timbers, paper, bamboo and more light materials. The bigger and scarier they are, the better! The parade is held with lots of noise, fire and ritual performances meant to attract the demons that still roam the island. 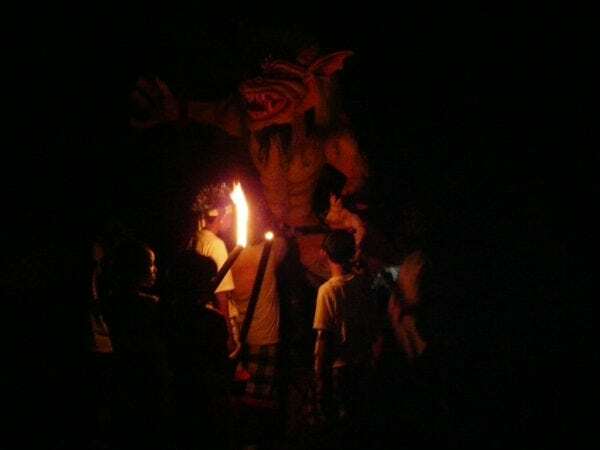 It is believed that these roaming demons and evil spirits will inhabit the Ogoh-Ogoh puppets and so they are to be burned by the end of the parade, together with the puppets. The parade is not only a ritual meant to attract and get rid of demons, it is also a competition. 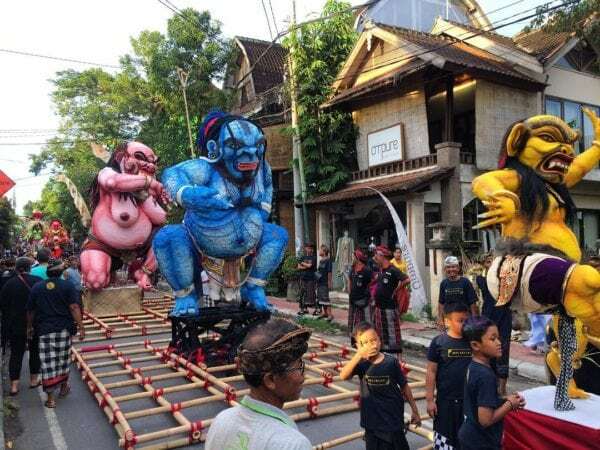 The Ogoh-Ogoh monsters are lined up on the street and one by one and each Ogoh-Ogoh puppet has their performance on the big junction in town, in front of the big crowd that gathers there and the jury. Fired torches, gamelan music and offerings – all are part of the performance. The Ogoh-Ogoh puppets sit on bamboo structures that are lifted by the strongest men in town. During the performance, the Ogoh-Ogoh puppets are shaken and moved in such ways that the demon appears to come to life. Ogoh-Ogoh literally translates to ‘shaken’. Winning this competition is of great prestige for the Balinese and it adds even more excitement to this special night. Where to see Ogoh Ogoh parade? Well, luckily, you are safe and sound on the compound of your private villa in Bali. There is nobody allowed to be out on the street but you can still lounge and relax under the sun in your private garden and dip into your private swimming pool every now and then. You can make this day all about relaxing, swimming, sunbathing, cocktail sipping, food munching and quality time with those you love(s). There are no noises except those sweet sounds of nature and all is utterly peaceful. Doesn’t it sound idyllic? I reckon we should all have a day like this! Make sure to have had your dinner before the sun sets over the island as lights have to be off. Travelling with kids?Don’t worry, for the little ones there are little exceptions made – they can have a little light by their bed. Make it a cosy evening in! You can still watch a movie, just close all the curtains and keep the volume down. 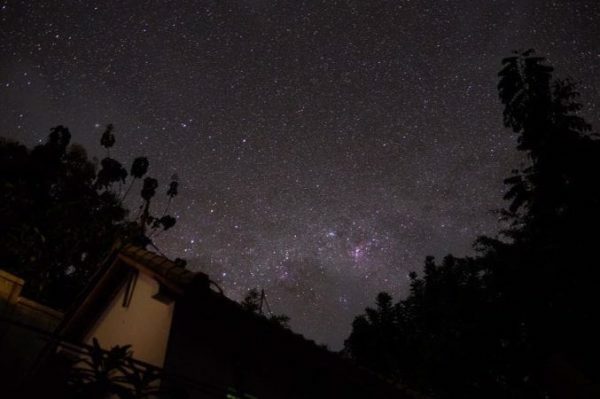 Before going to bed, make sure to check out the starry night sky from your garden or rooftop terrace. What you will see may be one of the most magnificent starlit skies that you every come across upon, as the whole island of Bali is dark. Note: ask the staff of your villa what is allowed and what is off boundaries during Nyepi Day and night. It is not the same everywhere. Check out the huge beach market that runs all the way from Tuban Beach to the end of Seminyak Beach, passing Kuta and Legian. On this day, everyone is allowed to sell their goods on the beach. There are souvenirs – and handicraft stalls and lots of authentic local food to try out. It is a lively and it is super nice to hang around here for a couple of hours. 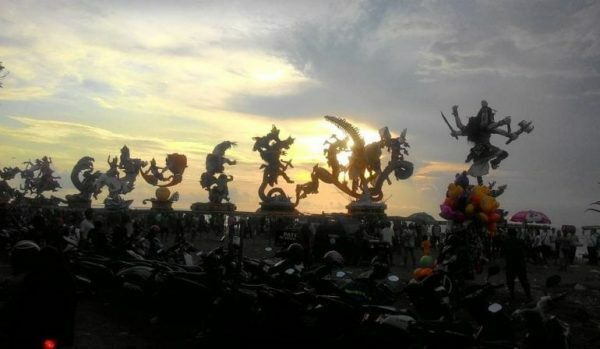 Some Ogoh-Ogoh puppets are sold instead of burnt and they are stalled out on the beach on the day after Nyepi. Why not seize this opportunity to take a freaky photo or two together with these giant monsters? Hopefully, the puppets are now free from their evil demon inhabitants. Pasar Majelunga starts at 9 am and lasts until midnight. 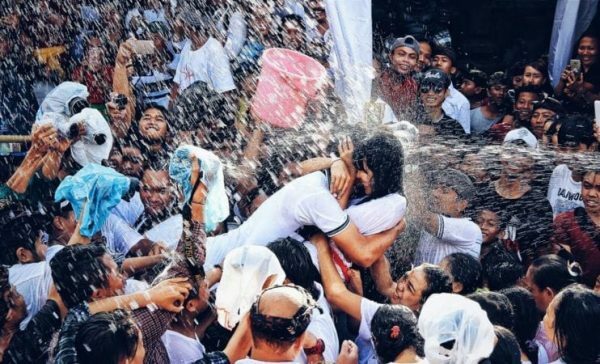 Also, check out world’s one and only ‘kissing festival’. Omed-Omedan is only held in Banjar Sesetan in Denpasar and it is quite something special, indeed! 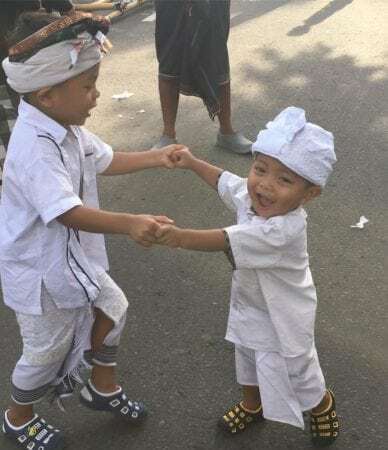 All the unmarried boys and girls from Banjar Sesetan, aged between 17 and 30 years old are lined up in front of each other in the street. The boys pull the girls closer to kiss them. In the meantime, the villagers pour buckets of water over them. Weird but fun and the story goes that this kissing ritual works well as a matchmaker. Go check out this kissing madness, everyone! Omed-Omedan usually starts around 2 pm. Prepare for big crowds, lots of kissing and lots of water! There you go, now you know everything you need to know about Nyepi in Bali 2018. To get the best insiders information on Nyepi in the town or village where you are staying, it is always good to ask the locals. They can tell you exactly where to be at what time to experience the scariest and most magical moments. Happy Nyepi! Selamat Hari Nyepi! 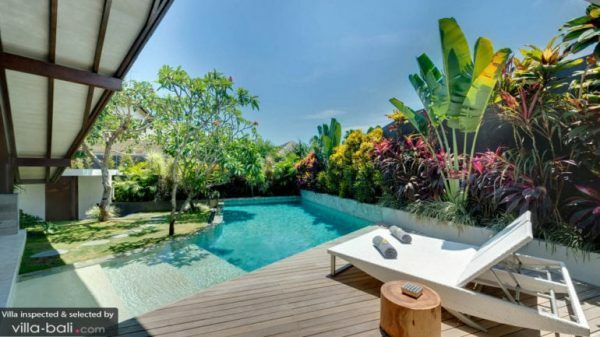 See our villa collection in Bali. Selected and inspected by Villa-Finder.com.